If you want a vision of real "gloom and doom" take a moment and ponder the possibility of a devastating cyber-attack on America's power grid. Being a believer in several of the ideas and theories presented by writers like Nicolas Taleb, author of the best sellers "The Black Swan" and later a book titled "Antifragile" it is not unusual that I might find Ted Koppel's new book interesting. The book titled "Lights Out", reveals that a cyber-attack on America's power grid is not only possible but likely and that we as both a country and as a culture are shockingly unprepared for such an occurrence. In fact, our whole society has become based on what we consider an unending flow of current that allows us to live lives of comfort. There is no question that the moment the lights go out everything would change and both our country and economy would immediately be forced into survival mode. emember when, not so long ago, much of the Mainstream Media was mocking people who stocked up on emergency supplies ("preppers") in case of a catastrophe as a bunch of "rightwing" survivalist kooks wearing tinfoil hats? Well, it now appears that Ted Koppel is wearing a tinfoil hat because he is warning about a possible apocalyptic catastrophe that could knock out the nation's power grid for up to two years and is recommending that people stock up on emergency supplies. Ted Koppel the veteran newsman and the former anchor of ABC’s Nightline has written a book that delves into how we have grown accustomed to cyber-attacks but makes the point that we have never had a cyber-attack that amounts to a weapon of mass destruction. In the past attacks have resulted in grand larceny or what amounts to the huge vacuuming of intelligence information. In a television interview, Koppel said, "My point is that if someone succeeds in taking down one of our power grids, and the Russians and the Chinese can do it and maybe the Iranians and the North Koreans, it would be devastating." In the past when the lights go out it is usually because of Mother Nature and we have always managed to get through it. But what if the power went out in a number of states affecting millions of people for weeks, even months? In "Lights Out," Koppel paints a grim picture of a paralyzing power outage in the form of an all-out cyber-attack on the nation's electrical grid. We Are Totally Unprepared For This! Koppel says that for about three years a number of our top leaders, including the president have warned of those who are trying to get into our infrastructure, especially the power grid. He points out that the president twice mentioned the issue in successive State of the Union addresses, but did not dwell on the risk. The secretary of defense at the time, Leon Panetta, called the threat of a cyber-attack on the power grid potentially a cyber-Pearl Harbor. Koppel interpreting the statement as important also noted that nobody was paying any attention to it. This became the motivation for his book, as he wondered, A:) are these people just exaggerating for reasons I don’t quite understand, and, B:) if they’re not, what is the government doing to prepare for it and to prepare the public for it? His instinct told him that the answer was going to be "not much", and when he researched the matter it turned out to be closer to the truth than we might think and this is not an exaggeration. The power grid is the system that connects North America's supply of electricity so that if one area has particularly heavy demand, power from another region can serve as back-up. The downside to all this is that because it is interconnected if a hacker manages to take down an entire grid, a huge portion of America along with parts of Canada could lose power. The electric grid operates as a series of networks that are defined by geography, failure in one place can cause failure in another place, which can cascade into a collapse of the system in a large area. 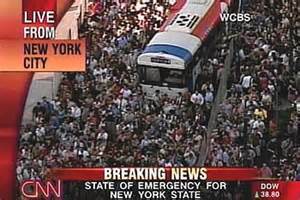 On August 14, 2003, a power line in Ohio overheated, causing a widespread blackout that affected over 50 million people, it lasted up to four days in some areas. After talking to many people, including the last four heads of the Department of Homeland Security and Department of Defense Koppel got the sense that none of them knew what to do if such an event were to occur. More frightening might be that several of them know that the likelihood of it happening is great. When Koppel spoke to Janet Napolitano just after she left after five years on the job as secretary of homeland security he asked the question, what do you think the chances are of a cyber-attack on the power grid? She said very, very high, 80 to 90 percent. Apparently, the conversation with Jeh Johnson, who currently runs Homeland Security and was trying to be more optimistic also failed to be very reassuring. Koppel said, "It didn’t go well, because, on the one hand, he conceded that the likelihood of a cyber-attack on the power grid is great. On the other hand, when I said, OK, what’s the plan? You’re the secretary of homeland security. He sort of dismissed it and said, well, as long as you have a radio with extra batteries." When Koppel pressed him it became clear that even while most people view formulating a plan for such an event as the responsibility of the government he found that they haven’t taken that responsibility very seriously, or at least have not come up with a solution yet. At issue is the fact we must deal with this the possibility of the power grid failing, but, and because we don’t know of any way to do so we have totally avoided the matter. The Economy Would Grind To A Halt! As to fears he will be dismissed as a doomsayer Koppel indicated he was more worried if people later found out what he had discovered and done nothing it would be a greater ill. Knowing there is not a plan, and that mass evacuations from places like Manhattan can't be done because we have a situation of too many people and no place to put them must give us pause. The author spends three chapters of the book dealing with the Mormons because after 200 years of being driven from pillar to post they are the one group that has learned how to survive in difficult situations. Noting that they are probably about as well-prepared as any large group in the country. The one thing the Mormons do that he would recommend to Americans would be they put away a three to six months supply of food and water. While he understands that there are tens of millions of people in this country who can barely afford to put food on the table every day he recommends that those who can afford it stock up. Koppel takes the stand that if people do that and if the government has a backlog of freeze-dried food, which lasts up to 25 years, we can probably survive something like this, if not, there will be thousands of fatalities. Towards the end of the book, the well-respected veteran newsman quite provocatively lays out the case that in addition to all the wonderful things that it does the internet can be used as a weapon of mass destruction. Also, he makes it clear a major worry is it would not require a foreign government to cause such a scenario to unfold, nor would someone need a ton of money to do it. Someone sufficiently skilled in cyber-warfare, using an individual laptop, can inflict enormous damage. He was told by the man who was the former chief scientist for the National Security Agency, that he believes there are individual groups, possibly a group like ISIS that could buy the expertise, and that the equipment they need is available off the shelf. This makes his warning a very scary prospect. Those of us that have suffered through a few days without electricity will testify that it changes everything. Because I'm responsible for a number of buildings and the comforts of the tenants that fill them I'm very aware of the many problems that quickly surface when electricity takes leave. Elevators stop, alarms fail, pump systems, refrigeration, hot water, heating, cooling, communication breakdowns, and more grind to a halt. 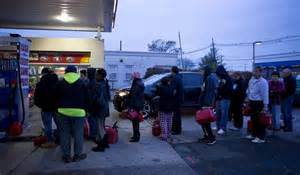 People can't work when businesses are forced to close, and cars don't move without fuel, even city water supplies stop flowing. Trillions of dollars of paper wealth based on "faith" in the system would vanish in the blink of an eye. The ugly bottom line is that because everything is intertwined and dependent on electricity in some way or form few things would work. If this occurs we can only pray it comes during a season when mother nature has blessed us with reasonable weather that won't rush to test our limits. My experience has taught me few Americans today softened by city life have the training and knowledge that they can flush a toilet with a bucket of water, my point is that overall we are a helpless lot. 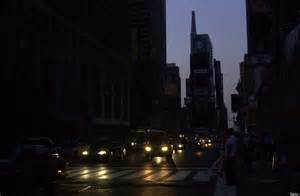 Few among us have researched the topic of grid failure to any degree, so I will defer to Mr. Koppel when he suggests that if and when the lights go off because of such an attack, that they will remain off for quite some time, and that power will be difficult to restore. I also cannot easily brush aside his worries and find myself troubled that nobody in the government has rushed to call his claims false. Koppel has no history of bantering about revelations that "the sky is falling" give credence that his concerns and warning should be given valid consideration. If such an event would occur in the cold of winter the death toll would be staggering, and I guarantee the government would be utterly paralyzed. I have done a fair amount of reading on this topic and suggest it might be wise or for others to do the same, and if they plan to do their search by a computer they might want to do so before the lights go out. Footnote; To those of you familiar with this blog you know that often the topics I write about are of an economic nature, below are a few articles that can be tied in with or are related to this article. As always your comments are welcome and encouraged. Auto Price War Ahead, Lower Prices Coming Soon! Wait For It, Lower Prices Coming! Prepare yourself for a price war in the automotive sector. For a long time, I have had a problem with economist and others pointing to the auto industry as proof that the American economy is on the mend. Years of rising auto sales driven by artificially low interest-rates have driven sales and leases. While we hear claims that the auto market is hitting on all cylinders we also hear of far too many unemployed students buying new cars. Failure to focus on where the sales are coming from or originating is a mistake and so is not recognizing that the industry is creating its own problems in future years. Recently, we have heard about sales, not about soaring profits. Record levels of channel stuffing will often produce sales gains, but no profits. The facts behind what has pushed this market forward are very disturbing. Over 31% of all new auto loans, this year were to subprime borrowers. Subprime loans now account for 36.5% of all outstanding auto loans. The easiest way to become a subprime borrower is by defaulting on previous debt obligations. In a shocking development, auto loan delinquencies have been surging, this means subprime loan delinquencies now stand at 18%. Pretending to sell automobiles to people either dependent on money from the government or no means to pay for that automobile is not a good business idea. When you have huge financial lenders and the rest of the Wall Street banking consortium doling out 7 year 0% loans and subprime loans as if it were candy it’s easy to move inventory. Sadly, while this has temporary boosted the GDP the issuing of what is destined to become more bad debt always comes back to haunt us in the long run. A big problem is that such lending often increases the monthly obligations of people who are already struggling financially. The Federal Reserve has been pumping in trillions of dollars of liquidity into the economy and much of it has resulted in pulling future consumption forward. These policies will soon become a headwind to both future sales and growth. This is more proof of just what an infusion of money from the Fed can produce and how it adds to the great distortion. Auto loan debt continues to ratchet higher every month and is at an all-time high of $950 billion, up 33% since 2010 when the Fed, Wall Street, and the political class in Washington decided they needed new debt bubbles in auto loans and student loans to jump start our moribund economy. Recent figures showed that there are 65 million auto loans outstanding, and the average debt now stands at $17,352. Currently, over 30% of auto “sales” are actually leases. The rest are financed over an average of 65 months. This means that virtually all new car sales are nothing more than 3 to 7-year rentals. Issuing billions of debt to subprime borrowers for housing proved to be a disaster and going forward we should expect the same trend to reveal itself in autos. This will result in a slowdown in American factories and have a dampening effect on growth. New-vehicle sales in the U.S. were up 13% in 2012 and up another 7.6% in 2013, since then it has been up, up, and away. The problem is that now more used cars are about to enter the market. Manheim Auto Auctions expects 2.1 million off-lease cars to hit the market this year and says that could rise to 3 million or more by 2016. This is good news for used-car shoppers but does not bode well for the automakers. 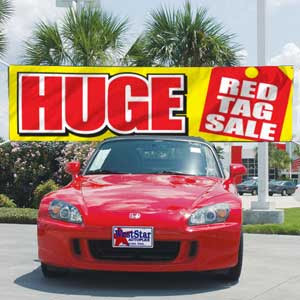 When used car prices are strong consumers are more inclined to consider and buy a new car that cost only a little more. Because many people have chosen to lease cars in recent years we are now positioned that millions of used cars will soon be thrust onto the market as leases expire. This flood of used cars is expected to put massive pressure on the prices of used cars as well as reduce the need for many people to buy a new vehicle because of a secondary market that offered only limited choice and selection. Going forward all this will dampen new car sales in several ways. Car shoppers can expect their trade-ins have less value meaning they will face both larger loans and bigger payments or forgo the purchase. This will carry over and make leasing more expensive because automakers base lease rates on predicted resale or "residual values," which is an estimate of what the new car will be worth at the end of its lease. Another factor we should not underestimate is that many of the used cars entering the market will be attractive top of the line models with all the bells and whistles. These lower used-car prices are a delayed response to the new-car market's revival from the recession: From a bottom at 10.4 million in 2009, new-car auto sales are on track to break 16 million this year. John Rosevear who has been writing about the auto business and investing for over 20 years, and for The Motley Fool since 2007 has suggested that if you want a nice car you might want to wait a little longer. Much like the airline industry the auto sector has always had a history of being a "glamour" industry, this means it tends to attract individuals who enjoy both risk and attention. It also means it is full of stories marking past failures and littered with names that no longer exist. A chief reason the automobile industry took a beating during the 2008 downturn was because the world was mired in overcapacity. When this occurs companies are forced to cut prices and are faced with reduced profit margins. It is important to note that as competition sharpens it will most likely result in the demise of many of the weakest players in coming years. Any slowdown auto sales or the economy will only hasten this event, and put the stock prices of auto companies under a lot of pressure, do not be surprised if the issue of bailouts or downsizing again becomes necessary. Most at risk are the smaller players that will have difficulty raising capital in this industry that constantly demands a company invest huge sums of money to stay competitive. While military leaders drool at the thought of possessing and controlling armies of high-tech killing machines not everyone is so enthusiastic about such weapons and the thought of adding artificial intelligence to their repertoire is even more frightening. Recently an open letter was presented to the International Joint Conference in Buenos Aries that was signed by leaders in the field of AI, such as Stephen Hawking and Elon Musk, it made the case that governments should not go down the path of an arms race in AI by developing systems with offensive capabilities that can operate without human intervention. In Britain, a May 27, 2015, article in the Telegraph reported an academic has warned that killer robots which being developed by the U.S. military will leave humans utterly defenseless. Make no mistake progress is being made by several countries to move in the direction of producing a slew of these weapons that can perform many different functions. About 28 minutes into the Democratic debate on November 14th Hillary Clinton talked about recently revealed Russian plans for a drone submarine with nuclear tactical capability. While I have written on the subject before an occasional "Killer Robot Update" has merit. This subject should not be limited to drones, killer robots, and a slew of other ugly possibilities. Blame it on an imagination gone wild or a distrust of those with too much power. Unfortunately, more recent revelations about the American government spying on us, our friends, and the leaders of our allies across the world does little to calm my concerns. We must take note that technology is quickly blurring the line between drones and robots at the same time that the killing power of these machines is being ramped up, we should be afraid! To say these machines have the potential to become formidable and a danger in the wrong hands is an understatement. Let it be clear, killer robot-drones are no longer the stuff of science fiction and the technology to make such weapons exist today. The U.S. Navy’s X-47B, a Northrop Grumman-developed drone, has already accomplished the task of taking off and landing on an aircraft carrier entirely on its own, it is only a short step to add missiles to its weapons bay. The unmanned plane is capable of supersonic twists and turns with a G-force that no human being could manage, and could take autonomous armed combat to a whole new level. In South Korea, several years ago a Samsung subsidiary designed a stationary robot sentry that sits along the demilitarized zone and can identify and fire at a target on its own. It’s linked up with a human operator for now. 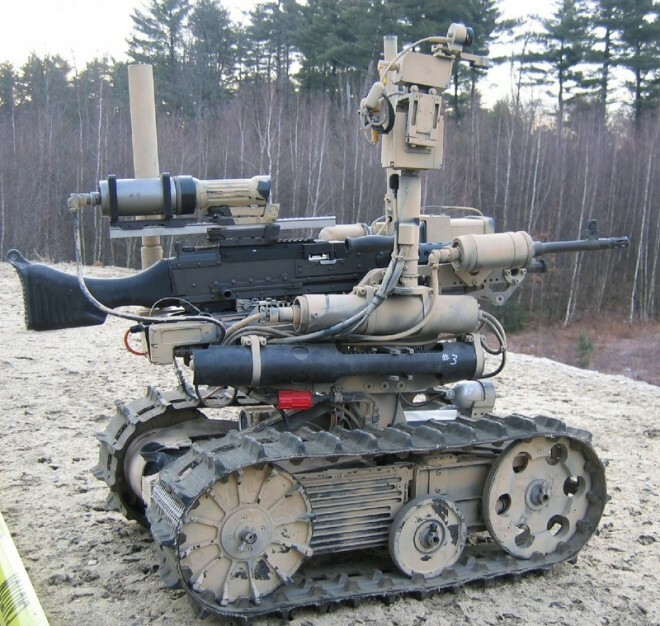 The website --- http://www.wired.com/dangerroom/2013/10/weaponized-military-robots/ ---goes even further when describing the advancements of these killer robots with automatic rifles and states they could be on the battlefield in the next 5 years. An October 18th article by Allen McDuffee says Robots armed with automatic weapons, anti-tank missiles, and even grenade launchers are marching, er, rolling ever closer to the battlefield now that they’ve shown they can actually hit what they’re supposed to. Many people feel giving a non-human technology the ability to decide if a human lives or dies is simply morally reprehensible and puts these weapons on the same level as chemical and nuclear weapons. There are just too many issues and variables that make this unacceptable. What if a killer robot malfunctions and begins firing at random? What if it’s hacked? What will happen once an enterprising nation kicks off the "inevitable" AI arms race, experts ask? Once these weapons find their way to the battlefield, the letter continues, it would then be only a matter of time before they hit the black market, at which point they would wind up in the hands of terrorists and all sorts of other unsavory individuals including dictators and tribal warlords. How quickly will the technology proliferate, to rival states and to non-state actors like extremist militants? And who exactly is held legally accountable when a killer robot attacks? So far some 272 computer science experts from 37 countries have signed on to support a ban on development of autonomous robot weapons technology. Loud is the outcry over U.S. armed drones killing civilians and how the U.S. has expanded their use is causing worldwide outrage. Reports from the United Nations, Human Rights Watch, and Amnesty International, and the lack of transparency on the use of drones from Washington recently resulted in a debate at the UN. A movement has emerged to get ahead of another potential problem by establishing an international ban on fully autonomous lethal weapons dubbed “killer robots,” it’s a technology that can kill targets (humans) without any human input. Whereas drones today have someone somewhere remotely determining where and when to fire, a fully autonomous air, land, or sea weapon could make the decisions on its own. Until a binding agreement is formed, expect concern to continue growing over the potential of robots to undermine human responsibility in decisions to use force thus obscuring accountability for the death and destruction they will cause. The Guardian says a "The Stop the Killer Robots" coalition that includes many of the groups that successfully campaigned to have international action taken against cluster bombs and landmines is working to get a similar global treaty against autonomous weapons. Still, the U.S. military is slow to rule out the development of technology in this area. The Department of Defense has issued an ambiguous directive on autonomous weapons that restricts but does not rule out their use in the field for the time being. This appears to be America's only government policy on the technology, and, unsurprisingly, few countries have formal policies on the issue. Of course, advocates say the weapon could, in fact, become a crucial tool for saving lives. “While a preemptive ban may seem like the safest path, it is unnecessary and dangerous,” wrote law professors Matthew Waxman and Kenneth Anderson, both members of the Hoover Institution Task Force on National Security and Law. They continued, "It is quite possible that autonomous machine decision-making may, at least in some contexts, reduce risks to civilians by making targeting decisions more precise and firing decisions more controlled." May I suggest the possibility this subject has been largely kept off the radar of the American people by those wanting our government to go "all in" on this technological arms race. People under the impression we can come out on top are often driven by the fear it is only a matter of time before it happens anyway. Please note, a preemptive weapons ban is not unprecedented. In 1995, parties to the UN’s Convention on Conventional Weapons added a protocol banning blinding lasers. Leading up to that ban, the U.S. was against it but after considering the potential for mass proliferation the U.S. changed its stance and helped generate support for the measure. Ultimately, this is a call to action and suggests a ban on "offensive autonomous weapons." Those pushing such an agenda cite similar international agreements on chemical and biological weapons, space nukes, and lasers that blind people. For now, the U.S. says it doesn’t support an international ban on this technology but pressure is being applied by groups like the UN. It should be noted this isn’t the first time the Pentagon has played with weaponized robots, but earlier experiments proved such machines weren’t ready for prime-time after some of them moved without commands. Northrop Grumman’s CaMEL (Carry-all Mechanized Equipment Landrover) was among the armed robots on display, it can be fitted with automatic weapons, anti-tank missiles, and grenade launchers. It can run for more than 20 hours on 3.5 gallons of fuel and carry a load of 1,000 pounds. 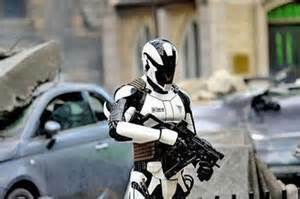 It also can produce power to charge batteries or power other systems and a hybrid engine allows the armed robot to operate very quietly on the battlefield and travel farther to provide firepower where it’s needed. “CaMEL is a multi-function platform that can quickly transform from supporting troops to protecting troops as an armed wing-man, increasing the firepower of dismounted platoon and company maneuver units,” said Phil Coker of Northrop Grumman in a statement. It appears Isaac Asimov's 3 Laws of Robotics may have been tossed into the trash bin in mans rush to build a better killing machine. All science-fiction readers will remember these were the laws that were to be built into all machines that would keep them from ever harming a human being. It is possible that Asimov's 3 Laws of Robotics have been overridden by Forest Gump's Law of "Stupid Is As Stupid Does!" A half-crazed lunatic might even praise a killer robot for its performance and not hesitating when ordered to kill and slaughter unarmed women and children. No need to worry about PTS or all the costly issues and problems human soldiers present, with killer robots it all becomes about killing! Europe Is A Dysfunctional Mess! To say the Euro-zone is a dysfunctional mess is an understatement. 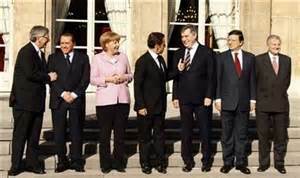 Proof is apparent in the many articles such as the one appearing on October 5th indicating Italy has asked fellow Euro-zone members to back a common unemployment insurance scheme to shield the continent’s jobless from future economic shocks as part of Rome’s broader push to deepen integration in the single currency. Pier Carlo Padoan, Italy’s finance minister, who unveiled the plan in Luxembourg, said it would mark “big progress towards solidarity — or risk sharing” across the Euro-zone that suffered deep divisions during this year’s tense negotiations over a new Greek bailout. The economy of the 19-member union grew 0.3 percent in the third quarter, slowing from 0.4 percent in the prior quarter is the report from Eurostat, the trade bloc’s statistics office. “So far the message coming to most of the citizens of Europe from monetary union is that it’s about banks and fiscal tightening, not about growth and jobs,” Mr Padoan said in an interview in his office. “This proposal is part of trying to convince Europeans that Europe is part of the solution, not the problem.” Again the reality is that a pan-European jobless scheme would struggle to gain traction because several Euro-zone members will be wary of funding a policy that requires the bloc’s healthier labor markets to support its weaker ones. Just last month, supporters of deeper financial integration hit a roadblock from Germany in their efforts to secure agreement on a common scheme to protect bank deposits. Meanwhile according to a report from the ECB lending to the private sector slowed in September, suggesting the bank’s stimulus measures have yet to spark a significant turnaround in the region’s economy. According to the ECB report, lending to households was 1% higher than one year ago, a slight acceleration from August, but this occurred as lending to businesses slowed to 0.1% last month from 0.4% in August. 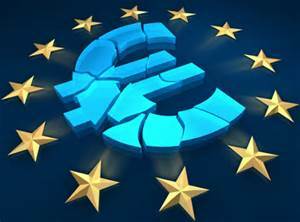 The fact remains the Euro-zone economy is going nowhere despite all the over the top efforts by the European Central Bank to stimulate the economy. As usual difficult structural reform is lacking and the only real effort being made by politicians is to give the impression that leaders are hard at work trying to arrive at how to correct the problem. It has become the chief pastime of those in power to meet and talk, then meet and talk some more, but action is seldom seen. Adding to the Euro-zone's woes of economic stagnation is contagion flowing from slowing economies across the world, a October 20th article in the Guardian is an example of what they face. The piece delves into how about half of the 1.6bn tonnes of steel made globally comes from China and why firms operating in the UK simply can’t compete. Guardian contributor Karl West, wrote; The latest grim chapter in the long, slow death of Britain’s steel industry may have been decided in India, but it was scripted in Beijing. He then continues saying, Tata Steel, owned by the Indian conglomerate Tata Group, just announced it has been forced to cut 1200 jobs in Britain.because it has been hammered by a toxic cocktail of high green taxes on emissions, a strong pound, slowing demand coupled with cheap Chinese competition and over capacity. Stories like those above are all over the place and this is even before we get to the issues growing from a massive flow of refuges into the Euro-zone. While the boost in population would cause a person to envision eventual economic growth from increased demand for goods and services, near term concern is over the cost of assimilating more than a million people into society. 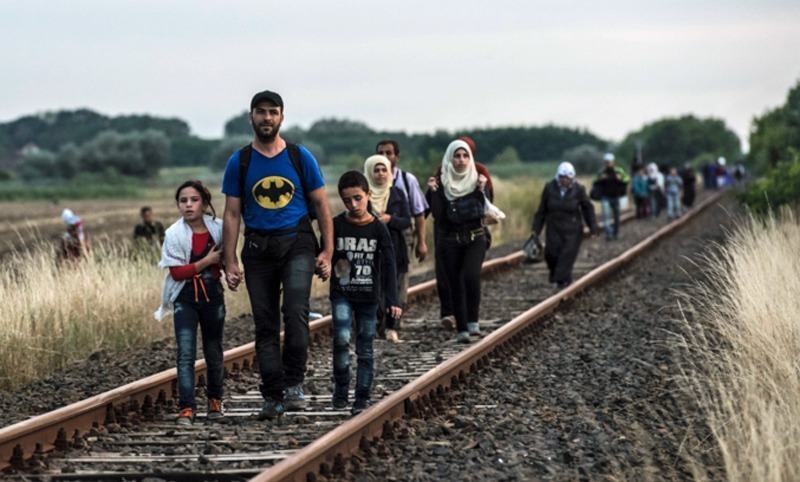 It should be noted these people arrive with nothing and often do not even speak the language. This has created conflict between not only countries already beleaguered by slow growth, high unemployment, and deficit budgets and their better off neighbors, but groups within many of its members. Gypsies in Italy have been considered by many Italians to be a problem for years and in several other countries unemployment coupled with worry over terrorist threats have raised concerns. This means it may be difficult for some countries to get enthusiastic about the refugees and migrants flooding the area. 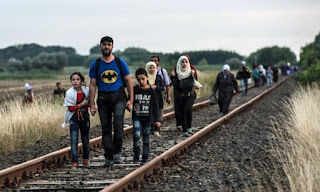 It has become common place to see pictures of poorly dressed refugees huddled in the rain and cold at the borders of countries denying them entry, this usually is complete with wire fences and armed guards. As usual the meetings of leaders in Brussels and other cities yield little other than more meetings and photo opportunities. The pledges to address the crisis as a common force produces little accept the promise of money and action to come, but nothing seems to get done. Mix in a few gems of unrest, such as the independence movement by Catalonia gaining strength in Spain, and it is easy to understand how fragile the Euro-zone really is. The frustration at just how inept and dysfunctional governments can be is not a unifying force that would make the people of Europe pass more power to those in charge. Footnote; Currently the thought of taking a holiday in Europe seems daunting. 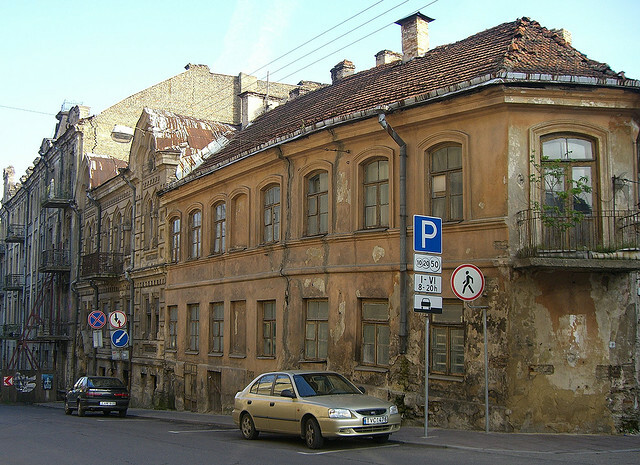 Attempting to travel through the area when facing closed borders, strikes, and homeless refugees has offset the excitement of tourist enjoying the weaker euro. As always articles on many subjects may be found in my blog archive, thanks for reading, your comments are encouraged. Today much of the new residential single unit freestanding construction in America is of the cookie-cutter urban sprawl variety. A great deal of this is driven by what is in the interest of big developers and not the buyer or society. This is driven by developers seeking a clear canvas and cheap land on which to build. Builders garner savings from mass production factory-like building methods with sites that are in close proximity which reduces travel time for workers. Huge developers also love to transfer the cost of upgrading the infrastructure to access these new communities to local government. Builders will tell you that buyers want covered patios for outdoor living, less-formal dining rooms, lots of space for entertaining because they want and continue to build units with 1,800 to 4,800 square feet, a size identical to 10 years ago. Do not underestimate how much residential construction skews the direction of growth in our country and society as businesses rush to locate near these new opportunities. This tends to gut and leave as wastelands large areas developed only decades ago. 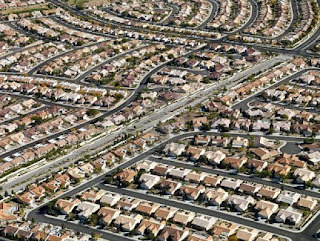 We should note all this "suburban sprawl" comes with a fair amount of ecological impact as ecosystems are paved over with concrete. Our modern lifestyle carries with it pollution of water sources, enormous amounts of garbage filling massive landfills, tons of carbon being spewed into a warming atmosphere, and several more damaging side-effects. It is a lifestyle choice that has been made for us and not necessarily by us. This is guided by the fact that bigger homes are generally cheaper to build per square foot than smaller ones, developers can make a wall a few feet longer, and give buyers more square feet without adding a lot to construction cost. Recently, I was reminded that many of the systems we take for granted are historical accidents, meaning they are based on legacy systems hundreds of years old or assembled in a short-term, ad hoc fashion to benefit a certain party, this means they may not be logical or the best choice available. In the case of housing, it often is the builder rather than the end user that benefits from the way communities are designed and constructed. Many of the homes being built in cities across the country look very similar to the ones built during the boom. Some, in fact, are even bigger. The average single-family home built in 2013 was 2,598 square feet, 80 feet larger than the average single-family house built in 2008, and 843 feet larger than homes built in 1978. And because it is easier for the builder to construct we find people are willing to accept such designs, many of the new homes going up are two-story with garages that fit two cars and look pretty similar to the house next door. This article is an attempt to point out what we want or should be buying is not always what we are offered, told we need, or directed towards. For example, it is logical when given a choice many people would choose not to spend their day in a car rushing to and fro, but rather spend the time smelling the roses. This brings us back to thinking about want we truly want and really adds value to our lives. Some people scream this planet is in its death throes while we keep on fiddling away. It is the belief of some planners that small dense towns or villages of under 50,000 people are the only viable, sustainable model for the future. These towns would produce most of their food and goods based on sustainable agriculture raising multiple crops in the same space, and small-scale industry, they would reduce, reuse, and recycle constantly, and they would promote a simpler, slower and less materialistic and consumer-based lifestyle. A close inspection shows little is different in the change-resistant home-building industry since the 2008 recession and the housing bust. Even surveys that suggest that both boomers and younger generations are interested in living in more urban places where they don’t have to spend so much time in the car getting to and from work, builders continue to bang up cookie-cutter communities out in the suburbs. Truth is this market is driven by building a fast, cheap product that looks good and will past inspection. Pride in workmanship and quality take a backdoor to issues like liability and the unit holding together until warranties given by the builder have expired. Some planners and “smart growth” advocates argue that builders should end the practice of buying empty land further and further out and building on it, and turn their efforts towards building more compact, walkable communities near public transit. It is not surprising that builders rile at the cost rehabbing existing land to fit new projects would add to their projects. In truth rehabbing existing developments is important for the environment, planers say this would save valuable resources and money in the long run, but builders are not interested in the long run. Sadly this trend is hard to change. Even the Republican Party adopted a platform at its 2012 Convention to inform and pledged to “expose” both state and local governments around the country to the “underlying harmful implications of implementation of United Nations Agenda 21 destructive strategies for ‘sustainable development’.” Seeing sustainable development as dangerous seems odd, but it points to a growing divide about how different people think Americans should and want to live in the future. Should we continue to live in spread-out, single-family homes with lawns and garages and spare bedrooms? Or do we accept the idea of smaller, compact houses where we can easily hop on a train or walk to the nearby restaurants and don't even need a garage or a car to park in it? Part of the goal of this article is to call attention to the idea housing generally puts "pretty over practical" and what best suits the developer drives what is being built. Those wishing to maintain the status quo are quick to point out that builders efforts to introduce sustainable developments have not always been successful or quickly embraced. Any walk-able, mixed-use community, adhering to many of the principles of new urbanism that do not sell well are tagged as proof nobody wants such a product. Builders constructing such compact homes with garages in the back and a big, public park in the middle, with a swimming pool and dog park, so residents can walk and interact with each other often include plans to build coffee shops and other retail within the community. We should remember however that since these planned communities are not being allowed to grow organically they often fail to achieve that "certain something" that makes them pop. This debate is ongoing and will not end anytime soon, it is all part of the "social engineering" issue mankind will face in the future. This involves modifying a lot of the zoning and building layouts from the old era and it isn't going to be easy. To achieve real change we face several major challenges and when it comes to implementing a real shift in both housing and how we live our lives it will require a critical mass change in public opinion and market direction. While studies may show that the younger generation wants small, compact, transit-accessible housing, builders claim to know better and say "once they decide to have kids and dogs, they’ll want the traditional suburban home with more space." 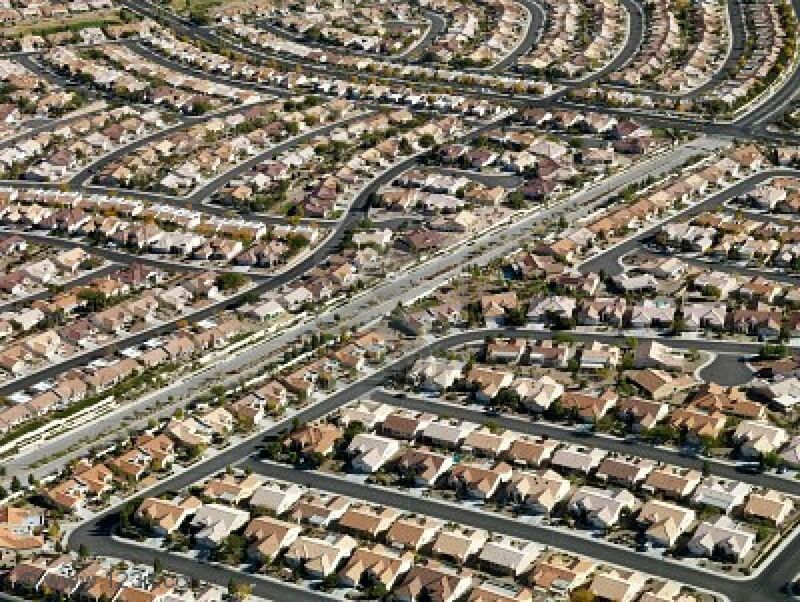 Some people may say they want to live downtown forever, but when reality and life take over they have a kid or two, or hookup, and they suddenly become "those people" and want to have a house in the suburbs. In the past areas like California have often lead the rest of the country when it comes to adopting environmentally-friendly policies that are sustainable for the long term. We should not be surprised if other areas are slow to adopt what they call "smart growth" and just as America is divided politically, it may become a more divided country in the way its residents live. People in cities such as Washington D.C., Boston, and Seattle may embrace more walkable developments, while consumers in other areas where land is cheap may continue to live in sprawling suburbs. It will be interesting to see how this largely unplanned development unfolds going forward, and how much it is affected by changing values of consumers rather than what is easiest for large builders. In such a growth scenario where change really occurs, there is a place for small companies focused on remodeling and building homes in already developed areas. 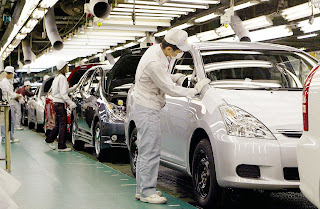 A recent poll of 19 economists showed that Japan, the world's third largest economy, most likely contracted at an annualized rate of 0.2 percent in the third quarter, following a 1.2 percent contraction in April-June. This means Japan probably slipped into technical recession again in July-September due to a combination of soft external demand, weak private consumption, and a drop in capital spending. A technical recession is defined as two consecutive quarters of economic contraction, while this does not mean the economy is falling off a cliff it does not bode well for those claiming things are on the mend. This is expected to keep policymakers under pressure to put forth additional monetary and fiscal stimulus in the coming months to bolster the flagging economy. Currently, the Bank of Japan has tried to portray an upbeat attitude towards the future arguing that the economy remains on track for a moderate recovery. The fact is the BOJ remains between a rock and a hard spot even if they are in no mood to ease policy further anytime soon. Many economist point to a China-led global slowdown as a large risk to Japan going forward so it is understandable many eyes are focused on the third-quarter gross domestic product (GDP) data to be released by the Cabinet Office on Nov. 16th. It is clear that Prime Minister Shinzo Abe's government has been tweaking the budget for the current fiscal year to shore up demand, but the size of any additional fiscal stimulus has yet to be make clear. 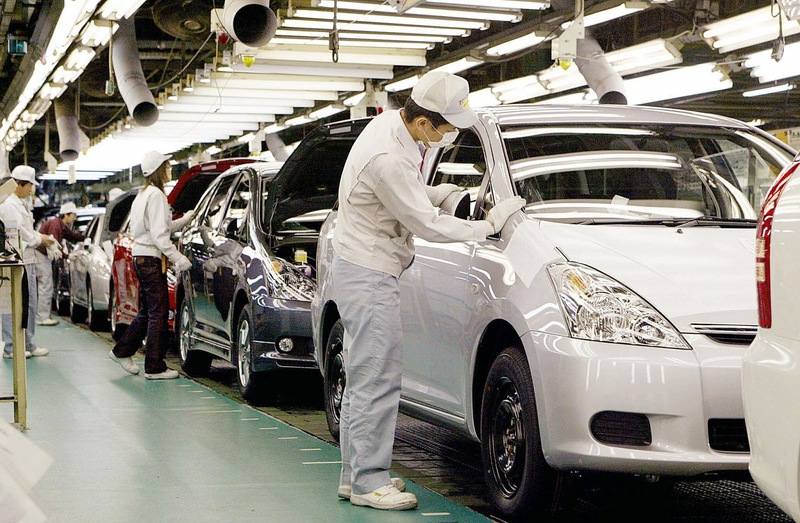 Yusuke Shimoda, an economist at Japan Research Institute said, "The economy continued to stall in July-September as business investment weakened while companies tried to shed a pile of inventory." Shimoda added, "We expect a return to growth in the current quarter on improving corporate profits and household income. But the pace of recovery will be modest as China's slowdown weighs on business and consumer sentiment." As usual the message remains guardedly optimistic that things will soon improve, but reality is growth remains more or less nonexistent. The GDP data is expected to show private consumption, which accounts for about 60 percent of the economy, grew 0.4 percent in July-September, but this was following a 0.7 percent previous quarter decline. Little help can be seen in external demand where growth likely came to zero, and this is after it shaved 0.3 percentage point off the second-quarter GDP. Another problem is that despite strong business investment and capital spending plans appeared to be in place by the BOJ's tankan quarterly survey, companies have been slow to follow through and raise capital expenditures. Companies have even come under criticism by officials for not picking up the pace. Lack of strong demand and the slowdown in China are being blamed for capital spending declining about 0.4 percent quarter-on-quarter in July-September, this makes two straight quarters of declines. I feel it would be remiss not to again reiterate that Japan would be sitting in far worse shape if it were not for the wealth shifted each year from America to the small island nation. America spends billions each year defending Japan and by purchasing many of the goods the country produces. The massive trade deficit America has with Japan of around 76 billion dollars a year feeds large amounts of money into Japan, without this money the massively indebted nation would face even bigger trouble. Demographics are also a problem, Japan is stuck with an aging and shrinking population that is evermore expensive for the government to provide for. Japan's public debt, now stands at around 230% of its GDP and is the highest in the industrialized world. It is hard to be optimistic about the future of Japan or the yen when confronted with such facts. Footnote; This is one of several articles I have written about Japan over the years, below are a few others that tend to paint a picture of future economic disruption. Articles on many subjects may be found in my blog archive, thanks for reading, your comments are encouraged. When looking back over history it is hard to argue with the fact that trends can simply run out of steam, lost momentum is not always sudden. Economic policies function under the same laws and because something appears to be working for a while does not guarantee its future success. It is silly to think that everything always collapses at the first sign of pressure and it is logical to allow for a lag-time or delayed reaction to occur. We may be experiencing the effects of attrition slowly eating away with its constant wearing away or grinding down the underpinnings of our economic system and yet to have felt the impact of the quiet and gentle erosion beneath our feet. Today Chase bank in an effort to cut cost shuttered a couple of their branches in my city, one of them was in a very nice building directly across from my office. Actions like these shout volumes as to what is really happening across America and do little to underpin the job market or real estate prices. What started as the Fed's short-term solution to prop up and stabilize a troubled economy has morphed into business as usual and become accepted as normal. More and more it seems that people have accepted the idea that the economy is evolving and other than that nothing is different in the way it operates. The truth is we are accepting less than spectacular results from an ill-conceived economic policy and placing them in a positive light. Considering the amount of newly printed cash that has been created and poured into the economy our failure to achieve escape velocity should trouble us far more than it has. This could be said about the global economy as well, growth is constrained considering central banks have been more than generous at the same time governments across the world continue to run huge deficits. Clearly austerity has been deemed a dirty word and any country claiming to pursue such policies has done so in word only. Currently the economy is slowing, not only in America, but across the world. What many people see as a lack of momentum could be something far more disruptive and disturbing, it could be we are beginning to see attrition starting to take its toll. Attrition is defined as "the action or process of gradually reducing the strength or effectiveness of someone or something through sustained attack or pressure." Today real and solid economic growth as traditionally defined is very elusive and has been largely replaced and supplanted by something harder to understand. Growth in both the financial markets and the "virtual part of the economy" made up of items like the internet, smartphones, and other things that create little in the way of tangible growth has become the driver of our lives while demand in many key more conventional areas languish. Trends in the type of small businesses being created or how they are changing can give us a peek into the future and a hint at what is to come. Over the years we have seen a substantial change in the nature of new businesses that give a glance into the future and developments that will shape both society and the economy. Years ago small independent doctors began having their practices purchased by bigger groups, than hospital giants, next we had a slew of mortgage companies form, they vanished when housing crashed. Today between the thrift-shops and secondhand stores we have seen the following popping up, tattoo parlors, nail salons, massage parlors, coffeehouses, photography studios, and most of all staffing agencies that provide workers for local businesses. Many of these business start-ups have two things in common and that is little in the way of capital is needed to open their doors, and most have a short unprofitable life span. Yesterday as I drove across town and saw all the buildings sporting "For Sale" or "Available" signs the term a great waste land came to mind. More and more lately I have found that many of the people requesting to look at commercial space for a new business are clueless or totally unrealistic as to the numbers involved in leasing space and starting a business. Even more disturbing is that in the last two weeks I have seen tenants leasing residential space from me who I know are on a very shaky financial footing, approved for purchases they are totally incapable of handling, one just bought a house, and the other a new car. The gal buying the house has had her utilities turned off several times due to non-payment and the other person has at times been months behind on rent and received food stamps. Both of these transactions signal problems ahead and are proof the Fed is pushing on a string in hopes something will happen to transform our sagging prospects. Forces that have been at work for sometime have weakened and worn down many real businesses and the new "Uber business" model should raise great concern because it has the potential to steer our economy off the cliff. Watching real businesses with a dozen or more employees closing their doors to be replaced by independent part timers playing by their own rules does not scream "quality growth" and has the potential to have a very debilitating effect on the economy undermining both social stability and communities. The Fed can only move the economy forward so far by way of artificially low interest rates and questionable loan standards before they come back to haunt us. This article was written to make two points, one a lot of what is happening reflects an economy that is crippled and getting weaker, the other to say sometimes it takes longer than we think it should for reality to raise its ugly head. Healthcare Is Still A Broken System! Its Not Over-The System Remains Broken! Many people think that since Obamacare has been around for a while it is proof that the law works, but the fact is it will be several more years before its sustainability can be verified. The few aspects of the law also known as the Affordable Care Act that have been popular such as, a person can no longer be banned from getting coverage because of prior healthcare problems, could have been achieved in a much less disrupted manner than how they are handled in this law. More important and seldom considered is the long-term ramifications it has on society and the economy. This is a subject that has been spun every which way to serve the views of the person presenting their opinion or argument. One thing impossible to refute is the cost of healthcare insurance has soared for many Americans since it was enacted into law. The long-term effects of Obamacare are slowly becoming apparent and by far the biggest problem is that it has driven healthcare cost through the roof for many Americans. The promise that this law would give the average family better coverage at a lower price has vanished into thin air. Insurance buyers have been forced to overpay for stuff they don't need so the money can subsidize other people. Obamacare is not about healthcare, it is a massive transfer of wealth through hidden taxes, penalties, mandates and coverage requirements that yield a surplus of over-payments. Washington did not address or focus on the crux of our healthcare problem which is how to cut healthcare cost so we could get more and better coverage for our money spent. Obamacare has put this issue on hold so the real and important issues behind high and rising healthcare cost will now only be addressed after the pain has become unbearable. The U.S. healthcare system is an unplanned mess that was not designed, but grew and developed on it own. The system of employers providing healthcare insurance began as a means of offering a bit of extra compensation in the 1940s era of wage/price controls. A situation developed that those without jobs were covered by the government at horrendous expense, and those with coverage became terrified of risking it by moving to less secure employment or self-employment. Employees and the self-employed are often expected to pay their co-pays and fees but are given little real choice. Most regions are served by two or three insurers or in reality a sort of cartel making any "choice" purely illusory, and this means costs are soaring. It is clear the ACA has shifted consumer spending and is altering economic growth. Healthcare in 2015 ran about $4 trillion and accounts for almost 23% of the $17.4 trillion GDP. This is big business at it worst and the cost of the two behemoth government programs, Medicare and Medicaid, even exceed the Pentagon's budget. Gone is the infamous promise Obama made on how the average family will save $2,500 a year on healthcare coverage, it has been supplanted by frustration about affordability. It’s not just about your premium, it’s your deductible, it’s your co-payment, it’s this combined package of expenses that everyone faces. In reality getting more people to sign up has just become an issue of forcing Americans into choosing the "least worst option" and the suggestion people should "tweak" their plans and adjust them to make them more affordable is simply another term for self rationing to millions of Americans unshielded from rising cost. On the PBS Newshour just last week Judy Woodruff did a piece that was the second part of of a series looking at the Affordable Care Act which is now starting its third year. She stated "This weekend marks the beginning of open enrollment in the health exchanges, and we’re looking at some of the questions about costs and coverage. One development this fall that’s turning into a concern for some consumers, a series of collapses of an alternative to traditional insurance plans known as co-ops. Nearly half of them, which were created through the Affordable Care Act, are now shutting down." It seems roughly a half a million people in the ten co-ops that have folded that are going to be out there again looking for plans because their co-ops have been unable to remain financially solvent. Those that had been in these co-ops are now facing paying more and getting less. The administration says there are about 10.5 million people that are eligible to enroll in the exchanges this year and they hope to enroll about one in four of those, but they admit it is an uphill battle. They have on their side rising penalties, the first year, it was $95 or 1 percent of your income, whichever is greater, for 2016, that increases to $695 or 2.5 percent of income. So, while the administration is emphasizing they want people to shop on the exchange, they also want to make it clear that you must have coverage, unless you meet a hardship exemption or other exception. What they may be underestimating is how many people drop coverage, regardless of the penalty because they simply cannot afford to buy what is being served, or even worse move onto the government roll because of healthcare cost. The silver plan with the second lowest-cost is often viewed as the "benchmark plan" by which all the subsidies are tied, and its cost is going up in many areas, Oklahoma, for example, is facing an average increase of 36 percent. The fact is Healthcare in America is still a broken system by any measure. Americans spend more on healthcare then people in other developed countries with very poor results. Our system allows insurance companies to not only stick their nose into every interaction you have with a health care provider, but to take a large cut as well. It has become virtually impossible to find a modestly-priced traditional insurance plan that protects a person from unforeseeable catastrophic accidents while letting them own responsibility for the accumulation of their lifestyle choices which remain a big part of healthcare cost. Healthcare companies are not allowed to base and price policies on past use history or reward the healthy 50 something marathon runner from a fat slob suffering from self induced diabetes. The largely unplanned system that has developed is totally unresponsive to economic factors, and this is the heart of the current system's dysfunction. We have removed the consumer from the equation and pricing has become purposefully opaque. The cost for a test or procedure is all over the map, and insurers have little interest or incentive to demand truly transparent pricing. Huge hidden discounts lurk and are dispensed only to the powerful at the cost of others. The federal/state healthcare programs of Medicare and Medicaid are riddled with the same lack of transparency and are vulnerable to fraud, over-billing and paying for needless tests, medications and procedures. This contraption of private insurance paid by employers, co-pays paid by employees and state programs means paperwork consumes an estimated 40% of all healthcare expenditures. This is a huge inefficient and needless expense. The bottom-line is nothing is waiting in the wings that will save us from the mess Washington has created, no fix or fiddling can solve the many problems embedded in this system. 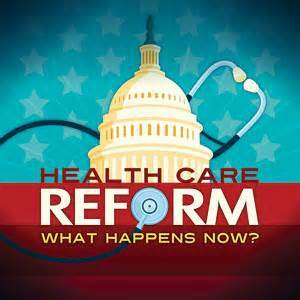 I'm not saying its "crunch-time" or that it will suddenly become obvious to everyone that Obamacare is a dismal failure, but instead that as time passes it will grow abundantly clear that the healthcare system has not been set right. Currently, the visible problem is the burden falls squarely on the shoulders of people who pay for their own coverage and are not eligible for subsidies. The invisible problem is that lurking in the shadows is how tax payers will react to the mega cost fostered upon them as the system moves forward and groans under the weight of rising cost never anticipated in the original figures. This means we must again revisit the crux of the issue, and that remains how to cut healthcare cost and get more and better coverage for the money spent. Footnote; Below is a related article that looks at some of the reasons healthcare in America is so expensive. Other related articles may be found in my blog archive, thanks for reading and comments are encouraged.